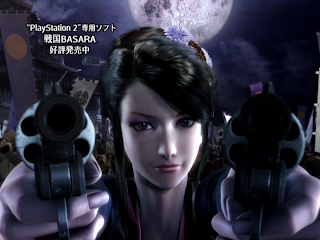 Unlike the later Basara Matsuri events, the footage from 2007's Haru No Jin festival didn't receive a standalone DVD release. Instead, it was included on a bonus disc with the Playstation 2 Sengoku Basara Double Pack which came out on July 19th the same year. 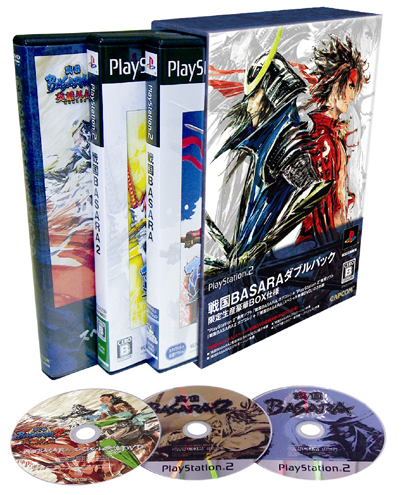 This set contained both Sengoku Basara and Sengoku Basara 2 on Playstation 2 together with the DVD. All three discs were packed inside a chipboard box illustrated by Tsuchibayashi Makoto. As could have been predicted this release format didn't go down too well; fans of the series had already purchased the games separately when they came out. It was a frustrating strategy given that these existing fans were also the ones who would most want to buy a DVD recording of a special event. Even today, with the games themselves having lost all value following the release of the PS3 Sengoku Basara HD Collection, sealed copies of the Double Pack are changing hands for large amounts of money. I picked up a used set from Book Off for a much more reasonable price. I'll be covering the games themselves as part of my thoughts on the HD Collection, so here I'm going to focus only on the special DVD. The presentation of the DVD is barebones, with a quaint pamphlet inside explaining how to navigate the menus (of which there are only three). The total runtime is 105 minutes which comprises footage recorded at the Basara Matsuri 2007 ~Haru No Jin~ festival and a collection of short video clips used to promote the games. Summarising the clips first, for the first Sengoku Basara there's a promotional reel intended for use in shops to attract buyers to the game. It's joined by a cinematic-heavy video from the 2005 Tokyo Game Show, and a retrospective short which was shown at the Basara Matsuri 2007 ~Haru No Jin~ event itself. Sengoku Basara 2's videos include another storefront promotional reel and three clips from Basara Matsuri 2006 ~Natsu No Jin~ entitled "Story", "System" and "Modes". Meanwhile, Sengoku Basara 2 Eiyuu Gaiden (Heroes), the brand new game due to come out a few months later in Winter 2007, was represented by a special promotional video and character introduction movies for Katakura Kojuurou, Azai Nagamasa and Oichi. None of these films contain anything new and the in-game graphics now look terribly blocky after becoming accustomed to the new HD Collection; still, the completist in me appreciates having them all collected onto a DVD. At the time of its release, the new clips from Heroes would have been an especially exciting incentive to pick up the set. However, with so many promotional videos, the DVD only contains 80 minutes of actual event footage. It looks as though what was dropped were audience participation games and announcements - probably due to wanting to avoid showing any members of the audience - which left seiyuu interviews and live performances as the remainder. Basara Matsuri 2007 ~Haru No Jin~ was held on 25th March 2007. It attracted an audience of 2,000 people and took place at the since-demolished Tokyo Kousei Nenkin Kaikan event hall in Shinjuku. Development of Sengoku Basara 2 Eiyuu Gaiden (Heroes) had been announced a few weeks beforehand, so presumably some time was spent bringing the fans in attendance up to speed on the latest developments. The event kicked off atmospherically with six komusou performers playing shakuhachi. Komusou have special significance to Sengoku Basara fans as they appear in some of the games as secret bonus targets called 'fugitives' ('otazunemono'). 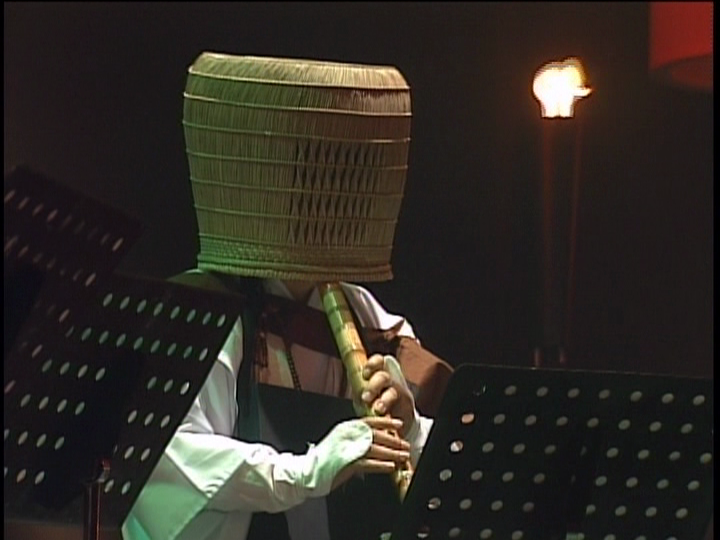 At the end of the song, one of the performers remained on stage and pulled the basket from his head to reveal his identity: Morita Masakazu, voice of Maeda Keiji! Haru No Jin was a small event by today's glamorous standards. The other seiyuu present were Noto Mamiko (Oichi), Ishino Ryuuzou (Chousokabe Motochika) and Nakai Kazuya (Date Masamune). The first item on the agenda was a talk session with series producer KobaP (Kobayashi Hiroyuki), which included individual prerecorded video messages from Morikawa Toshiyuki (Katakura Kojuurou) and Hoshi Souichirou (Sanada Yukimura) sharing their thoughts about their characters and the new game. Live 'mini drama' performances from the seiyuu followed, including some exchanges from Heroes. The fans cheered and clapped loudly to spur the actors on. A segment called Keiji's Room was next, which involved Morita chatting to the other two male seiyuu guests and presenting some questions from fans. This was quite raucous and Morita was a great MC as always, keeping the chat flowing freely. My favourite part was when he incredulously tried to understand some English pronunciation along with Nakai. More live performances followed including a special drama for the event, then Keiji's Room returned with Noto on the couch this time as the guest. It quickly deteriorated into an adorable session of Noto taking responsibility for everything in Oichi's plaintive voice, with Morita joining in as best he could. The event footage then wrapped up with final messages from the four seiyuu guests. If the DVD is a fair representation, then 2007's Haru No Jin wasn't the most content-packed Basara Matsuri event. It was charming though to see a smaller group of seiyuu in a less formal setting, where everyone got enough time to speak candidly about their roles. While I'm not sure I'll rewatch the disc regularly, I'm pleased that I was able to see it. Reports from Hobby Channel and Game Watch are still online with additional pictures taken at the event.